Last week I came across a fabulous gem that just happened to be in our own store. I don't work there that often and sometimes my hubby will get sneaky and bypass me completely when he finds inventory so that I won't want to keep things for myself. So, I happened to pop into the shop early one morning last week to do some cleaning when this fantastic piece stopped me in my tracks right at the door. Of course I immediately called him and asked if I could take it home and being the sweet man that he is, he didn't mind at all. So we loaded her up and I parted with our barnwood table I built and put it in the shop in it's place so it really was a win win, right?! This farmhouse table must have previously had a sink in it as there was a hole in that shape in the top. I didn't care cause I knew I could cover it with a piece of wood. The patina on the table is probably the best I have ever seen. It is the perfect worktable for our kitchen. The perfect height for being able to use for rolling out pastry and baking. The other side has an open shelf space that is perfect for storage. 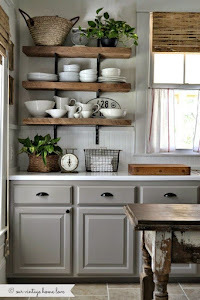 I also worked on another open shelf project with a thick piece of barn wood that my hubby found in a local creek. It's been drying out and aging for about a year and I finally decided to use it for my cookbook collection. I really do like having them displayed for inspiration. The wood pantry that used to sit in that area is now in our laundry room where we needed storage, so that worked out perfectly as well. Anyone else the same way? 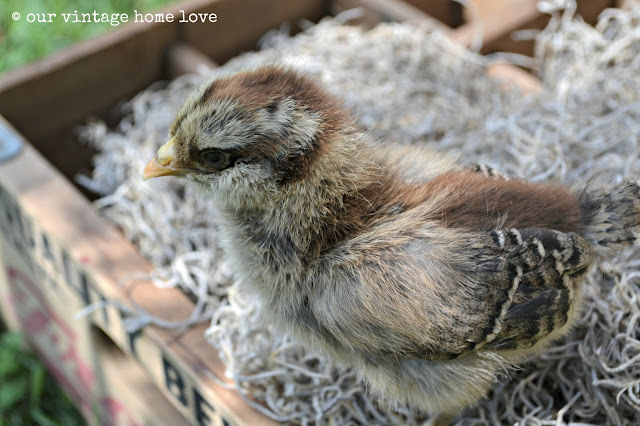 Our baby chicks arrived a couple of weeks ago and I am completely smitten with them. I never realized they could be so much fun. One of the highlights of my day is simply watching them play, and our whole family is enjoying them which makes me happy. We bought 3 Buff Orpingtons, 3 Rhode Island Reds and 1 Easter Egger. The Buff Orpingtons are my favorite. So friendly, sweet and curious. Our little Easter Egger is a bit shy but she is slowly coming around. The Rhode Island Reds, which we have had before, are fun and seem to be the leaders of the tiny group. They have grown quite a bit in two weeks. I snapped their picture right after I put them in their brooder when they first arrived. Baby chicks suffer from the "big hand syndrome" so for a while every time we would stick our hand in to play with one to get them used to us, they would all run to the corner for cover. But now, they run to greet us, which is so sweet. We haven't named them yet because honestly, it is really hard to tell them apart, other than the different breeds. If anyone has any name suggestions, I'd be happy to hear them!